That is a good thing! I know I had to upgrade some of the fellas to the 12x12 huts, lol. Here is my cage, along with ALL my lovely Jen Craft products! Jen, I put in my order, and then you never told me what I owe you! :) Too much crazy life. Could you email that info to me please so that I can pay you for your beautiful work??? 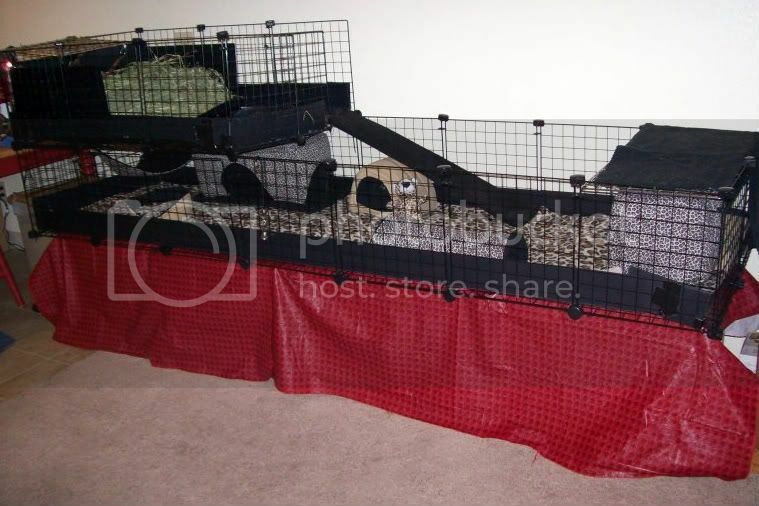 New to the sales forum and seriously considering buying some cage liners. For existing cage liner customers, I was wondering...have your pigs ever burrowed under the cage liners? Do you have to weigh them down with bricks or anything like that? I would like to get cage cut to size and stitched up for convenience and to prevent burrowing. Do the liners help? I have a 2x5 with a kitchen so I would be getting two 2x2s per set so there would also be a 'gap' in the middle. Do they slide around on the coro at all? If you have burrowers, they may still do it. If you do decide to buy liners I would get a few small sizes. That way they are easier to wash and you can replace dirty ones only. Buy the liners! Even if they do burrow, they are SO worth it! To Jedifreac: We have 10 cages of piggies and we use all cage liners in them. I'm lucky enough to only have one burrower come to me. He wasn't familiar with fleece bedding at all when he came here and he hid under the liners for a few weeks. Once he discovered the hut in his cage he figured out he could go in there and feel secure rather than under the cage liners. He has since stopped burrowing and I haven't had any problems again, so I can't be of much help there. The liners will actually overlap so that there is no gaps in the middle. They also don't slide around because it is a terry/towel material on the bottom which gives them some grip. We never have any problems at all around here. Yes, buy the liners! They make life much easier! I likely won't be placing an order until March because that's when the proceeds go to OCCH, the shelter I currently volunteer for. (An exception might be if there's a sale?) I am definitely interested in cage liners and maybe some accessories, too. I have a Star Wars theme caged so I was wondering how custom fleece and other fabrics work? Say, if I win an old Star Wars pillowcase on Ebay, could I mail that to you and have a hut made out of that? Does that reduce some of the cost of the material because then you don't have to use cotton from your existing stash? Or what if I like fleece I see on a site online? What have people done in the past when they do custom orders? 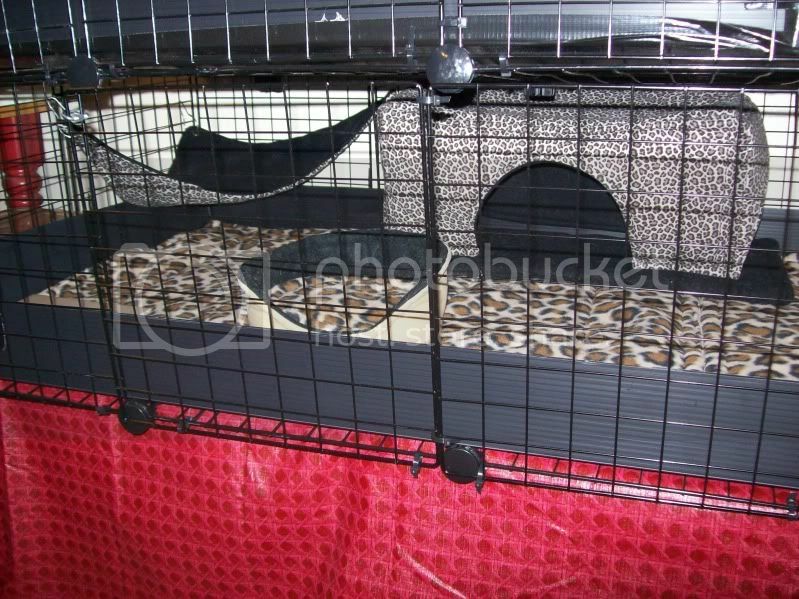 Jedi, she made a wonderful western themed cage for my Silverado and Bandit from an old pillow case! It was sent to her (I heart Brenda!) and her DH and her worked their magic on it. With the Force, all things are possible. A pillowcase is large enough for a hut, so yes that would work out great. I will definitely lower the price for you since you are providing your own material. People have bought their own fleece and sent it to me (I then reduce the price) or I have ordered the fleece for them and just charged any extra shipping fees, etc. that it cost me to special order the fleece. Whatever works best for you. Thanks Jen, CodyNpatches & NGM. Couldn't have done it w/o Jen's awesome products! Both yours and CavyCastle's will be just a few more days now. I'm sorry these last batches took so long. With the passing of my grandmother and moving, I got set way back. We are hustling to get all caught up now though, so definitely by the end of this week. I can't wait to get my hut - I think I'm more excited than the girls! My friends think I'm madm for pampering my piggies but they brighten up my world so its well worth it!